BAT - BLOG : BATMAN TOYS and COLLECTIBLES: New BATMAN-THEMED HERO-BOX OFFER From Superhero Stuff!! New BATMAN-THEMED HERO-BOX OFFER From Superhero Stuff!! Hey, I'll admit it. This post is an attempt to make some sales at one of our affiliates called SUPERHERO STUFF (Yes, I'm a Whore™ and this is a Sponsored Ad). Hey, online purchases were way down last month and the reality is I got bills and other nightmares! Plus, this site has become one of my main sources of income, arrggh! Whew! OK, Sorry to vent. But, to be honest, I think I would have mentioned this new thing anyway because it's pretty awesome! 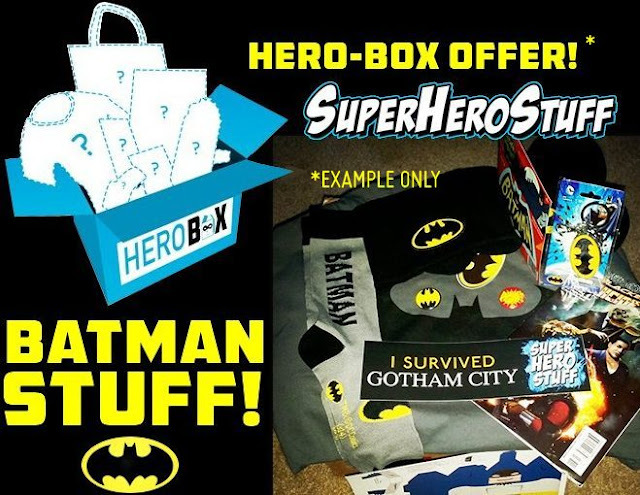 Superhero Stuff is a really great company, with wonderful products, and they have this new offer where they send you a HUGE parcel-box filled with fun products that all revolve around a theme that they like to call HERO-BOX! Of course they have one with a BATMAN THEME but other characters include: Superman, Wonder Woman, Green Lantern, The Flash, Spider-Man, Captain America, Deadpool, and Star Wars. Plus, each month they create a special assortment with a fresh theme. For MAY 2015 it was Marvel's "Secret Wars". For more information please click the banner down below, Thanks! !